Cardiff Castle dates back nearly 2000 years, from the arrival of the Romans in the first century AD. The Normans founded the Castle in 1091, on the site of an existing Roman fort. The Normans realized the strategic importance of the site and used it as a naval base and trading post. The Roman defenses were still in place and the Normans used them as the foundations of their own fortress. About 1090, Robert Fitzhamon built a mound with a wooden stockade within the site and a castle was completed the next year. The 12th Century was one of great activity for the Castle. From 1126 to 1134, Robert of Normandy was held captive by his brother Henry I in one of the castle's keep. 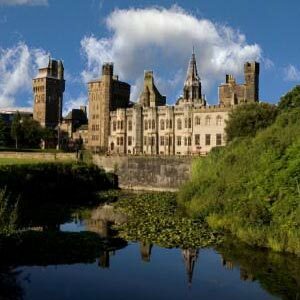 Over the centuries, the Cardiff Castle fell into the possession of many noble families. In 1766, it passed by marriage to the Bute family. The 2nd Marquess of Bute was responsible for turning Cardiff into the world's greatest coal exporting port. It was the enormously rich 3rd Marquess of Bute (1847-1900) who employed the brilliant architect William Burges (1827-81) to recreate a noble castle of the middle ages. This architectural scheme resulted in the Cardiff Castle - an example of Gothic Revival. In 1947, the 5th Marquess of Bute gave the Castle to the City of Cardiff and the local council has managed the site on behalf of the people ever since. The Cardiff Castle is open every day, all year round, except Christmas Day, Boxing Day and New Year's Day. A full guided tour will take approximately an hour to complete and will cost ?6.00 for an adult and ?3.70 for children. There are also discounts available for students. Tourists can visit the Cardiff Castle grounds alone for a lesser admission fee. The Castle gardens are an exquisite place where peacocks, ducks and geese wander freely. The visitors can also enjoy a break in the Castle tearooms, which offers a warm welcome for coffees, light lunches and afternoon tea. The Cardiff Castle also offers some of its stunning rooms for hire for private functions ranging from corporate presentations, meetings and wedding ceremonies. The other notable attraction about the Cardiff castle is the Traditional Welsh Banquet at the medieval hall where the visitors can experience great food, warm hospitality and captivating music providing a great value night at just ?31.50 per person, including all food, wine and entertainment.